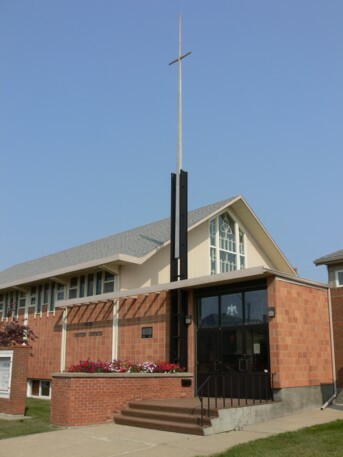 Located in the heart of Olds, Alberta, the United Church has witnessed the Christian faith through worship, service, and fellowship for 120 years (as of 2014). All are welcome to share in our ministry. than to be happy and enjoy themselves." Greetings visitors to our website! So good to have you visiting our site. From time to time I write a reflective piece here, or give an update on news or upcoming events. As we enter into the season of Lent, I want to invite those of you who are seeking a faith community to consider visiting our church, and spending time in worship and community with us. In Olds, we worship at 10:00 am, and in Sundre at 1:30. Here - in both church communities, you will find warm hearts and friendly welcome, so please come join us. Perhaps you might also like to join us for our Thursday afternoon lunches from 12 to 1. Bring a bag lunch, and join in conversation around the biblical stories we'll hear this season in worship. They alternate between Olds United Church and St. Paul's Lutheran Church - starting at OUC on March 7. As the days get longer, I find myself longing for warmer weather to go with it. I am beginning to hold on to a little bit of hope, as the weather reporters promise in the next few days we'll make to the plus side of the thermometer! I look forward to the warming of spring! For now, though, I must remember that it is still early in March, and I must be patient! Our United Church Moderator, Rev. Richard Bott begins his Lenten message with a comment on how important it is for Canadian's to talk about the weather - it's what we do. Richard also encourages us to go deeper with our talking, though, and to seek to know how our friends and neighbours really are - asking one another the question "How is it with your soul?" As we journey through this season, I invite you to consider Richard's message that as an alternate to giving something up for Lent, to take on a spiritual practise, to have those deeper conversations with others. Richard suggests finding a spiritual friend. You can listen to his message by clicking on the link that our web weaver, Kathleen Windsor, has provided here. Perhaps, this Lent, you could meet with another disciple of Jesus and explore the question "How is it with your soul?" Talk about the highs and the lows. Talk about the things that are bothering you and the questions that keep coming up. Talk about the places that you see God and the places where it feels like God just - isn't there. Talk about HOW you want to work to make God's world a better place for all God's children. Invite your spiritual friend to respond to the question, too. "How is it with your soul?" And then go and live your lives, fueled by your faith and filled with God`s love! When you can - maybe even the following week - meet again to share your experiences and how your soul is doing. I wonder what that might do. Not just for you-but for the church and for the world? I wonder too, what that kind of conversation might do for us, if we intentionally take time to deepen our conversations in this season, and to learn more about one another, and about our faith. As you journey through Lent, and have those conversations, may you find moments of compassion and hope, moments of wonder and joy, and perhaps even moments of healing for your soul. May you recognize the presence of the divine as you share with others in those soul deep conversations. Are you someone who has questions, who is seeking to explore your faith, and learn stories of our faith? You're welcome to join us in worship on Sundays, in Olds at 10:00 am, and in Sundre at 1:30 pm. If you'd like to have a conversation with Reverend Tammy, the minister of the Olds-Sundre Pastoral Charge, please call the Olds office and we can set up an appointment! The United Church practices an open table, inviting all who seek to love Jesus to share in our Sunday Communion, once a month. In the communion meal, wine poured out and bread broken, we remember Jesus. Everyone welcome. PAR (Pre-Authorized Remittance) - Are you on PAR? If you already pay bills, taxes, or your mortgage with automatic withdrawals from your bank account, then you've got the PAR principle. Monthly PAR (Pre-Authorized Remittance) offerings are an exceptional expression of commitment and allows you to support Olds United Church through automatic monthly withdrawals from your bank account. Prayerfully decide how much you want to give each month. Fill out a PAR Authorization Form with a cheque marked "VOID". Enclose both in an envelope and place on the offering plate, or leave at the church office. We send this information to the United Church's national office, who instructs your bank to automatically withdraw your gift around the 20th of each month. You can increase, decrease, or cancel your contribution at any time. To learn more, please call the church office at (403) 556-3052, The United Church of Canada at 1-800-268-3781, or visit www.united-church.ca. Thank you! WELCOME TO THE OLDS COMMUNITY LENDING SHELF! - Effective October 20, 2017 the Olds Community Lending Shelf became an outreach partner of Olds United Church. This means that this very important community non-profit is now housed in the lower level of our building, and has more space to carry out its work. We're happy to be able to provide space for these great folks, and we are pretty sure their director, Lucinda Watkins, has a spouse who is very happy to have his garage back! So, again, welcome! Rom 8:39 - neither height nor depth, nor anything else in all creation, will be able to separate us from the love of God that is in Christ Jesus our Lord. Thanks to the foresight of a rare gift from a prominent Olds businessman, deserving individuals or organizations in Olds will get a hand up again in 2019. 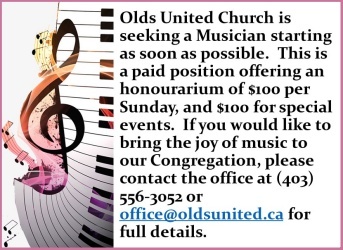 Olds United Church will be accepting applications until April 26th for annual grants from the Chic and Billy Miller Endowment Fund, created by a legacy from businessman, community booster and philanthropist Chic Miller. The fund is designed to support projects that meet the needs of the community of Olds. Key considerations in awarding grants from the fund will be the overall need of an individual or organization and the number of individuals who will benefit. <!-img src="gallery/photos6.jpg" width=141 height=115 border=0 align=right Alt="The church looks wonderful throughout the year. ">Our church is always beautifully decorated. 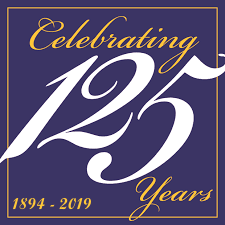 Visit our Photo Gallery to see our favourite pictures, including pictures from our 120th anniversary. Better yet, stop in for a personal visit! In his Lenten message, Moderator Richard Bott reminds us that this season is a time to think, deeply, about our relationship with God. He asks us each to consider meeting with another disciple of Jesus, and exploring the question, "How is it with your soul?" You are a child of God. He created you in His own image. He chose the day for you to be born. Look up your birth date and see what Bible verse corresponds to it. Click the image above to look up your verse now. Olds United Church is located on the corner of 48th Avenue and 50th Street, just a couple of blocks west of Olds College. Click the map for an enlargement.